If you missed a real life visit, take this virtual tour! 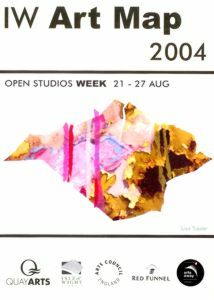 The Quay Arts Centre, in association with the Isle of Wight Council, The Arts Council, Red Funnel and Arts Away, produced an Art Map, the purpose of which is for artists to advertise themselves, their wares and to encourage visitors to their studios during Open Studios Week 21 - 27 August 2004.
buy some of Cat's pottery. 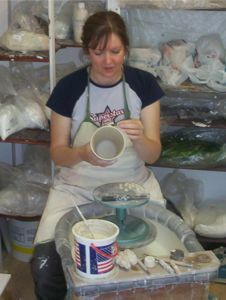 The studio was open all week and Cat took time out of her day job to receive visitors and make some pots. Cat's studio had over 130 visitors during the course of the week - not bad considering that the weather was atrocious at best! 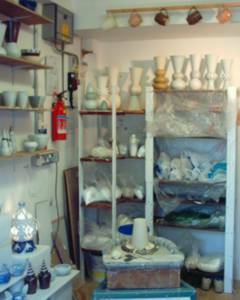 A small display of pots was assembled on an old card table and put outside the door in an attempt to entice passers by into the studio. It was a successful device, but it got very wet during the regular showers. 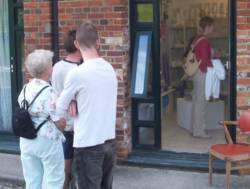 However, probably half of the visitors were passing trade; the rest had come along because they were following the Art Map trail. Some had even taken the trouble to visit Cat's website beforehand. Most visitors were happy to stay and chat for a while and some made several visits. Cat took the opportunity to hand out details of the Blue Room exhibition (which was still running) and direct visitors to the Quay Arts Centre and its shop which sells Cat's pots. 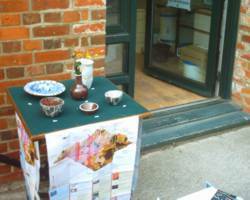 Some of the visitors recognised Cat's work and had already bought some of her domestic ware for gifts or use at home. The event, although tiring, was great fun. 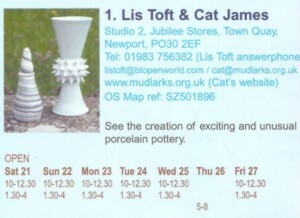 Cat sold several of her pots including one which is still being made! Cat assembled many of her favourite pots for the Open Studio event; for some of the pots, such as the brown vase (below - bottom left) it was their first public outing. The Art Map was very well publicised with copies being available from all Tourist Information Centres, on the ferries and from the Quay Arts Centre. 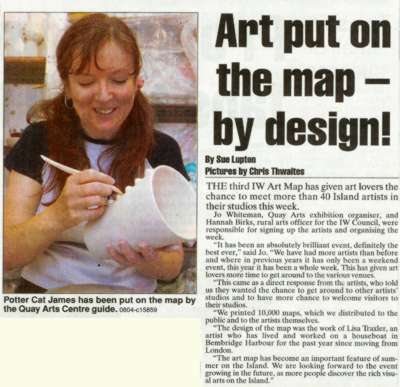 Cat was also fortunate to be featured in the Isle of Wight County Press two weeks in a row - including full colour photograph! You can't buy publicity like that!